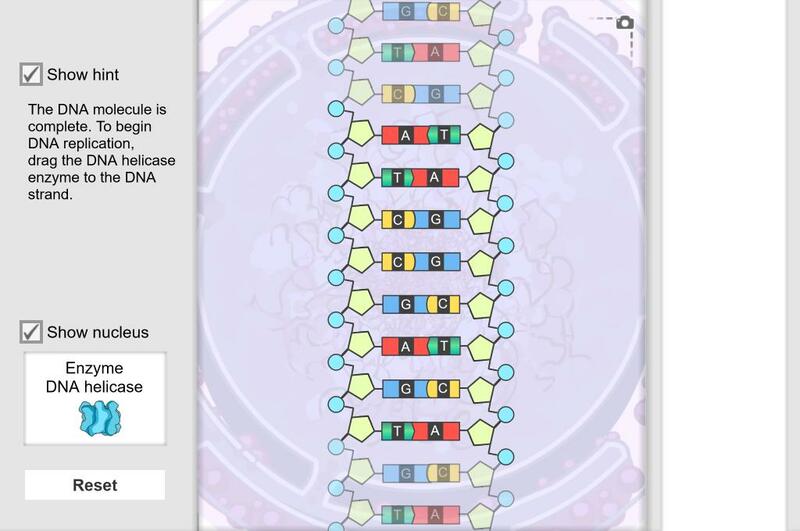 Construct a DNA molecule, examine its double-helix structure, and then go through the DNA replication process. Learn how each component fits into a DNA molecule, and see how a unique, self-replicating code can be created. I simply added a question (from one of the other contributors) and gave a bit more information to front-l... (more)oad the students. I also highlighted some more terms because my students will see them on their quarter assessment. I developed a student guide with less vocabulary and more repetition questions for my inclusion class of ... (more)regular ed students and exceptional learners. I modified questions and added new ones for use with my inclusion class that combines regular ed learners... (more) with exceptional needs learners. I eliminated several vocabulary words that standard students would struggle to retain. I have created a shorter assignment for this gizmo. My goal was to access if the students understand how... (more) bases are connected in a DNA molecule. Use of this gizmo as an introduction to DNA structure resulted in my students grasping base pairing concepts much faster than before. My Biology 11 U students enjoyed it and got 95% on the assessment. A very useful activity .